I met Kurt Beecher (you know him as the founder of Beecher’s Cheese) one hot afternoon amid a cluster of food bloggers, all eager to storm an armored truck shaped like a giant pig, parked at the corner of 2nd and Pike. Maximus Minimus, the much anticipated pulled-pork sandwich truck, had opened the day before to mild fanfare, but it was about to be put through its paces and make some unpaid bloggers very happy in the process. We met at Beecher’s in Pike Place late in the afternoon for a whirlwind tour of the factory. In reality, we walked into the cheese making room in groups of five, stood in one spot and listened to the cheese maker give a well-rehearsed spiel about curds and whey. I’m convinced this “tour” was a thinly veiled excuse to get us in hairnets again, but the air conditioned room was a nice respite from the melting heat outside. Plus, a few cold, moist curd samples made an excellent hold-over snack. After learning all there is to know about cheese making in 3.5 minutes, we gathered around Kurt as he unromantically recanted how Seattle’s best-known cheese came to be. Kurt is an unassuming, unpretentious and energetic guy – like a soccer dad, or a wilderness park guide – and you wouldn’t know he was an artisanal food mogul just by looking at him (read: no whisk tattoos or chef’s jacket). But he has built perhaps the most recognized and respected brands in Seattle, and Maximus Minimus, his brainchild born from a popular staff meal at Bennett’s, was poised to be a very clever piece of horizontal integration. 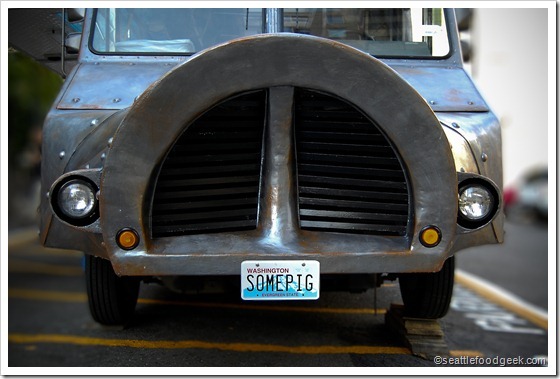 The concept is simple: a big, iron-clad truck shaped like a pig that serves 2 varieties of everything – maximus for spicy and minimus for sweet. Throw in some cold drinks, coleslaw, chips, and a vegetarian option so the carrot-huggers don’t file an injunction against public pork vending, and you’ve got great street food. Kurt scurried us two blocks up to the unmistakable truck which sat heavily on the pavement. By the time I arrived, the line of bloggers was already 20-deep, but moving steadily. Over the din of the truck’s galley kitchen I could overhear two employees taking orders at the front of the line, describing and patiently re-describing the choice between maximus-spicy and minimus-sweet to the giddy pseudo-journalists who were all lucky enough to be getting served after business hours. When I got to the front, I opted for the minimus since I’m not much of a heat guy. While I waited eagerly for my cardboard tray of food to emerge from the truck’s small window, I observed passers-by, one after another, stop and ask what the truck was. I assume the were led to this corner by the caramel smell of braised pork wafting down the city blocks. But when they arrived, they weren’t quite sure what to make of the big metal hog that looked like it came from another planet… or Freemont. In stunned bewilderment they gathered, standing slack-jawed for a moment, then continuing on, feigning that this was really something they see every day. When my food emerged, it looked great. In fact, it looked just as I expected, with the exception of the cheese. Given that this was a Beecher’s venture, I assumed that my soft pork sandwich would be oozing with gooey cheese, like an Arby’s melt but made from actual animals instead of recycled volleyballs. The only hint of cheese was a small sprinkling of white flakes, unmelted by the heat of the pork, and unnoticeable in any given bite. Still, the sandwich was good – not orgasmic, tongue-tingling, I’ll-switch-religions-for-this good, but pretty solid. The chips and slaw were a nice touch as well, though the two-handed tray made eating and drinking on the street a little cumbersome. The drinks were self-serve from two discreet taps sticking out the side of the truck. I didn’t get to try the ginger lemonade, but the hibiscus nectar was unbelievable. It had a strong, rich, floral flavor which I anticipated the moment I saw the iridescent magenta tea start pouring into my cup. Had I been without a straw, I’m pretty sure it would have left a KoolAid-esque mustache above my upper lip. The nectar was a great compliment to the salty tang of the sandwich, and would likely be just the right soothing antidote to the piquant maximus. I guess I’ll have to go back for more. Even though I won’t be making Maximus Minimus my new official barbecue Mecca, I’m still very glad for its arrival. With the weight of the world on everyone’s shoulders these days, it’s nice to find a little levity during lunch hour. And anyone who serves barbecued pork out of a hogified AirStream clearly cannot take himself that seriously. 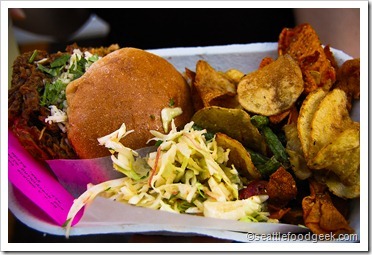 I hope that street food, and indeed the trailer concept, continues to take hold in Seattle. In high school, the closest thing we had to a cafeteria was the roach coach parked on the sidewalk during recess and lunch to peddle quesadillas and Horchata (I grew up in LA). You knew it arrived by the distant sound of La Cucaracha and the smell of leftover animal bits being mangled into a burrito. Even so, there is a special place in my heart reserved for 4-wheeled food. May I cast my vote now for a bubble tea, salumi and wood-fired pizza van somewhere on the Microsoft campus? Go trucks, go! Full disclosure: I got free food, but that doesn’t pay for my opinion. Just curious, who has the best pulled pork sandwich in Seattle in your opinion? You know, I really shouldn’t answer without doing my homework and trying a few more places 🙂 I do like Dixie’s BBQ, but I may be biased since they serve it in my cafeteria at Microsoft. What’s your favorite BBQ joint around here? I LOVE pulled pork and I LOVE cheese. Oh my. We are roasting a whole pig again this fall. If you are near Sacramento, give me a halla!! Great post. On a non-pork note; as someone who checks in almost daily, I’m really happy you’re posting again. Arby’s uses only 50% recycled volleyballs these days. The other 50% is “Other Fillings”. Economy and such. Stopped reading when I got to your digg at vegetarians. Btw had Maximus at the bite of Seattle today. Wow SOOO overhyped. Nothing special at all! Not to mention they put cilantro in everything! When will people learn that crap tastes like soap to many many people.